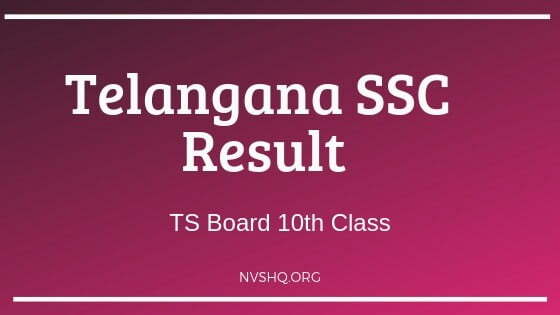 TS SSC Result 2019: Telangana 10th Class Results 2019 Manabadi. TS SSC Result 2019: Telangana board 10th class result date is expected to announce the result in the last week of April 2019. Students can access their TS SSC 10th results through official website of the Directorate of Government Examination, TS, SMS and IVRS services. In this article you will find all necessary information of your TS 10th scorecard 2019 and how you can download it online. We will provide direct link to download result here. Keep visiting us till scorecard is released for more updates on it. 1.1 How to check TS SSC Result 2019? Telangana SSC result can be checked through various methods viz. SMS, IVRS, and online method. In order to check result via SMS service, students have to send a text (in specified format) including their roll number to a number specified by the board. After the delivery of result, students will receive their result on their mobile no. The number for SMS and IVRS service will be updates here soon for the convenience of the students. Visit the official website of Board i.e. www.bsetelangana.org. On the homepage, click on the relevant result link. Enter the valid login credentials in the fields provided. TS SSC result will appear on the screen. Download and take a printout of the result for future references. After announcement of SSC result, students who will not be satisfied with their result and marks can apply for re-verification or recounting of the answer scripts. Board will be provided a time period under which interested students have to fill application for the re-verification. Board will notify the students about the application process, fee applicable, time schedule through its website. The application form will be made available on the portal and candidates have to fill it and submit it along with the prescribed fee within the stipulated date. Once the result will be announced, students will know their result status. Those who pass the examination will move forward to get admission to the next class. But those who not be able to pass the exam and getting compartment in various subjects will be given an another chance. Board will conduct ca supplementary exam who will not be able to get passing marks in one or more subject (as per Board’s policy). Those who want to pass SSC 2019 examination will have to appear for the supplementary exam. The information about the exam schedule, application, fee, and other details will be notified to the candidates through online portal and also through the school concerned. Supplementary examination for Telangana Board Class 10th are generally conducted in the month of June. The result will also be published on Board’s website. The online result sheet published on Board’s website will be provisional and only for the purpose of information to the students. Students are thus advised to not treat online result sheet as the original statement of marks for class X. The original mark memo will be issued after the declaration of online results to all the students. Students have to collect their mark sheets from their schools on specified dates. Generally, Board distribute the original marksheets of the students to the school and after that, it shall be the responsibility of the schools to provide the mark sheets to the students. Telangana 10th class result is supposed to release in April 2019. Result will be announced using the official websites of the Board on specified date. Fail students in one and more subjects will be given a chance to appear for supplementary exams and pass class 10th. Students are suggested to regularly visit the official website of Telangana Board for all the new updates and to get information regarding the release of result. Feel free to ask us the question related to the Telangana SSC result 2019 in the comment box below. నాకు 10వ తరగతి పలితం వచ్చే రోజు ముందు తెలియజేయగలరు .